In May, city officials took the wraps off a plan to bring red light cameras — which snap photos of vehicles illegally zipping under traffic signals — to Albany's most dangerous intersections. Citizens and politicians are now choosing sides. Assemblywoman Pat Fahy, an Albany Democrat, introduced the legislation that would give the City of Albany the green light to engage in a five-year demonstration program deploying automatic red-light ticketing cameras at as many as 20 intersections. City Police Chief Steve Krokoff signed on to the idea. Mayor Kathy Sheehan declared the cameras would be a critical tool in helping reduce the number of traffic, bicycle and pedestrian accidents. "When our police chief tells us that we need to be exploring red light cameras as a mode of making our public safer, that's when we need to consider it," said Sheehan. The city council voted 10-5 on a resolution in support of exploring the program. Common Council Member Dorcey Applyrs says citizens and lined up along both sides of the proposal. "I feel that this is an issue that residents should have the opportunity to weigh in on. I'm learning that this is a very contentious issue." Former Republican mayoral candidate Jesse Calhoun abhors the snapshot idea. The self-described "pedestrian" has formed an opposition group “No Albany Red-Light Cameras” or “N.A.R.C.,” and he's launched a music video to promote it. Calhoun thinks the incentives for the program are wrong. "There's lots of studies that have shown that accidents actually increase, especially rear-end collisions. In Los Angeles they showed they increased. Cleveland had ruled them unconstitutional because they were calling them “parking tickets” and people never got their day in court. It brings up issues like “Can you really face your accuser when you're getting a robotic ticket?” There's a lot of issues with them. Even in Syracuse the mayor said with these other cities running away from them why would we do them? So I wanted to raise attention in a fun way." 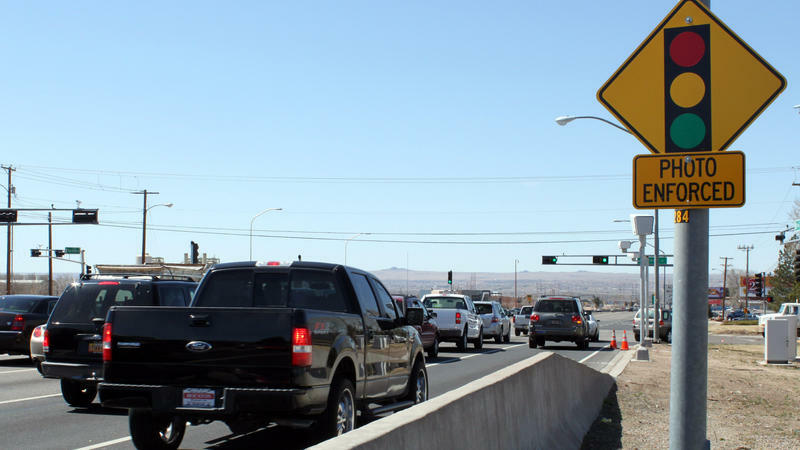 Assemblywoman Fahy admits there’s a slight uptick in rear-end crashes at intersections where cameras go in. "...but all of these would be marked in advance to let people know and to warn people." A vehicle running a red light would be issued a $50 dollar ticket, mailed to the registered owner. The city hasn't calculated how much revenue fines would generate, and don't see the cameras as a roadway to closing the budget deficit. The tickets would not come with license points. "Any red light cameras that would be used in the city of Albany would be at no cost to the city. They're contracted out and it's essentially like a shared leasing program." The trial program would run through 2020. Under the plan, 20 cameras initially would be installed at the most dangerous intersections. Calhoun is both alarmed that citizens haven't been told how the technology works and critical of the officials pushing the plan. 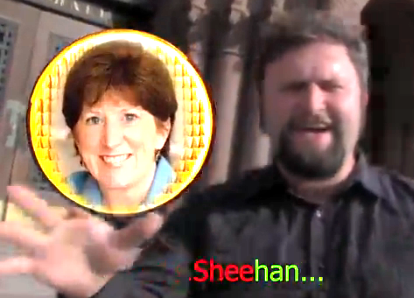 "They just go through this kind of process of manufacturing consent, where you have Patricia Fahy going forward with the bill, and you have Sheehan saying, “Well, it's about Fahy” and already she's trying to mold the consensus on this without really presenting the technology first to the residents of Albany and then allowing us to debate." Calhoun has taken the battle to a more personal level, deciding to challenge Fahy for her 109th District Assembly seat. Calhoun believes that lending his voice to the legislature will benefit disenfranchised constituents. Fahy, a first-term Democrat, would not comment on Calhoun's run. Red-light runners have become a dangerous norm in Albany. Now, city officials and state lawmakers want to bring red light cameras — which snap photos of vehicles illegally zipping under traffic signals — to Albany's most dangerous intersections. The mayor says it's not about revenue, while the police chief stresses it's all about safety: a bill that allows for the City of Albany to adopt a local law establishing a "five-year demonstration period" during which red-light cameras would be mounted at strategic intersections where motorists routinely ignore traffic-control devices. State Comptroller Thomas DiNapoli released a report concerning the financial condition of the City of Albany. A new bill introduced in the New York State Assembly will create funding to include Pre-K students as part of transportation aid that is received by school districts for K-12 students. Legislation introduced by 109th district Assemblywoman Pat Fahy would bring parity for Pre-K transportation by providing state aid to public school districts as is now provided for K-12 education. Launching and running a political campaign is one of the most challenging activities you can undertake. Launching a bid for local office or even mayor runs the gamut from intimidating to frustrating to exhilarating. American democracy enables all upstanding citizens to run for public office — at least, in theory. Going from idea and inspiration to launching a campaign is a process involving strict adherence to protocol, as New York Citizen One blogger Theresa Grafflin discovered when she attempted to run for city council in Albany's sixth ward.